James Neiss/staff photographerLewiston, NY - Modern Corporation C.O.O. 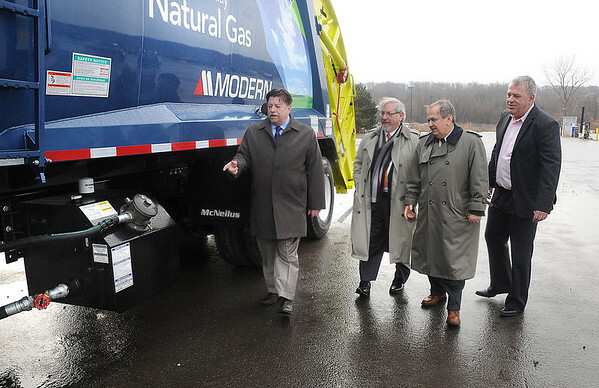 Gary Smith, shows off a compressed natural gas garbage truck to, from left, Francis J. Murray Jr., President and CEO of NYSERDA, Senator George Maziarz and Modern Corp. President Richard Washuta at their Model City Road facility. Modern Disposal Services of Model City and the New York State Energy Research and Development Authority celebrated the opening of a compressed natural gas fueling station today.